SUMMER IS COMING and because my blog is largely based on fashion (specifically affordable pieces, outfit repeating, and bold selections), I decided to write something about one of my favorite things: swimwear. I am all about keeping a wardrobe simple and minimal (regarding quantity). However, when it comes to swimwear, I am a materialistic, greedy, glutton. I love bikinis, I adore one-pieces, I covet cover-ups, and I love to pretend to be a natural-born beach-bum (polar opposite of my natural - most-likely actually polar - habitat). I have compiled my five top tips for mastering the art of swimwear. Enjoy. When it comes to buying swimwear, I mostly do it online. I do not have the luxury of trying things on in-person, unless I shop exclusively at Walmart (I live in hillbillyville, Virginia, oh, and I do occasionally wear Walmart swimwear). Because I can't see things IRL, I need to know what will be most flattering for my body. I recently discovered that I have one of the least cool body-types -inverted triangle- which goes against anything that you see in pop-culture or on your Instagram feed. It really only works if you're tall or super slim. I'm neither. If you don't know your body type, just look up "body shape guide" on google images and you will learn what "fruit" or "shape" you are. No matter what your shape is, the goal is to balance it out. For example, I have the hips of a nine year old boy, and a Pamela Anderson chest, while my sister has the hips of a mother of six and the ribcage of a nine year old boy. For me, I prefer suits that widen my bottom (ruffled sides or side-tie bottoms) and add the least amount of bulk to my chest or shoulders. Any top with padding, a wire, frills, thick bands, or sleeves is not my friend. For my sister (a pear), she can wear simple bottoms and a more detailed top. Draw attention wear you want it and away from where you don't. If you're tall, then tops with a wider band around your ribs can look really good. If you're short like me, those styles will just further shorten your torso. Do your research and see what works for you! However, in the end, it is honestly just best to wear what you are comfortable and confident in, even if its not what you "should" wear. Know your sites. Don't order from that FB ad that featured cute swimsuits at a suspiciously low price. If you order from one of those China sites: you can't trust the product will be as pictured, you don't get a quality guarantee, you can never rely on punctual shipping, and you definitely can't count on customer service being there for you if any problem occurs (it probably will). Swimsuit sizing is hard enough in-person, so you have to keep that in mind when shopping online. Sticking to brands you already wear is a good idea. I buy almost all of my suits from ASOS. Sometimes I will order two suits and return the one that doesn't work. I wear a dress size 2 typically, but with one-pieces I wear an 8 or 10. Swimsuit sizing is extremely weird and inconsistent. Bikinis are easier because it is more similar to shopping for a bra and underwear. Always read reviews for specific products, brands, and sites overall to ensure you're getting a quality product from a reputable source. When in doubt, size up. At 5'5, 118lbs, and a size 2, I most often end up wearing a size large/10. It doesn't make sense, I know. Be smart and use common sense when it comes to sites and know what brands work. Know return policies and order a few sizes, if needed. I still have mini heart attacks when I order a new swimsuit online. 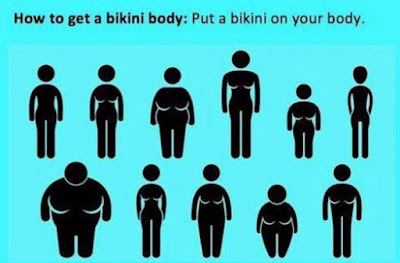 There are infinite body shapes but really only a few swimsuit cuts, so it can take some time to find what works. When you're deciding on a swimsuit, make sure you pick one to suit your occasion. If you are going to be more active, wear something secure. Don't wear a flimsy suit to go wake-boarding or you will come out with no suit. If you will be lounging by a pool, feel free to try something more impractical. I prefer simple (smaller the better) bikinis at the beach because one-pieces trap rocks and sand throughout the lining and, thanks to gravity, it will all end up in your girl parts. It is uncomfortable and totally annoying to clean out in the shower. DO NOT wear a white one-piece in the sand. It will be ruined. Save those for the pool. If you're going to a waterpark, wear the most secure suit you own (I'm talking like.. swim team status suits). If you plan on tanning, wear something accordingly (or wear nothing at all ;). I don't tan, so I can wear whatever strappy mess I want. So who's the real winner here. When it comes to modesty and swimwear, I am not the best example. I hate one pieces on the beach for the reasons stated above. In addition to those, they are harder to dry, which is more likely to contribute to UTIs or yeast infections, which I have to fight to avoid daily. If I am around extended family or kids I feel best in a dorkier one-peice. If I am at the beach with people I will never see again, direct family, or just my husband, I will wear what I want, how I want. Do what you feel most comfortable wearing around whichever set of peers surround you. I feel more exposed in some of my one-pieces than I do in some of my bikinis. Even my "modest" suits make me a bit uncomfortable around certain people. To be honest, I probably wouldn't even feel 100% comfortable in a wetsuit. I am a snowman by nature. I am pure white and covered in black hair. It's gross, but it's natural. I don't get tan in the sun, but I do freckle and burn. Before I go to the pool or beach, I feel most comfortable if I shave or wax for once and get a spray tan. Even though this advice is super controversial, I personally like to go tanning in a bed for a few minutes (maybe 4 minutes in a 15 minute max bed) at 3-5 times during the two weeks leading up to my trip. I do this because I burn so severely and easily. If I gently and slowly tan myself leading up to my trip, I've realized it nearly eliminates my chances of burning. It doesn't add much color at all, but that isn't the point. In the end, I believe it is healthier for me to avoid a burn all together and just prep my skin in a tanning bed. According to studies "there is no evidence to suggest a base tan will protect you from a burn," but from my personal experience it makes all the difference. I still use tons of SPF 30+ all day every day in the sun, whether I have my base or not and you should too. For diet, I try to avoid bread-type foods and an excess of sweets leading up to my trip. I drink a lot of water and smoothies and eat lots of plant-based protein. I just try to eat better. Nothing extreme but better than my usual routine. For working out I will go to the gym (maybe) and walk a little on the treadmill or use the stair master. I stretch a lot and do some crunches on a stability ball. Little things like this may not make a huge difference physically but they definitely help me mentally prepare for wearing a swimsuit. Do what you need to do to feel your best in swimwear. If you want to wear board-shorts and a tank top, go for it. The point of going to the beach, pool, waterpark, lake, etc, is to have fun, enjoy yourself, and enjoy the company of those around you. I feel great with a spray tan, spf 50, and a Walmart bikini on the beach. You may not and that is okay. Swimwear can be immensely stressful and personal for some people. Even if you do feel nervous, do what you need to do to feel better but don't waste your time hiding in a caftan under an umbrella (unless that is your definition of fun). You are your own worst critic. Other people aren't going to be nitpicking your every so-called "flaw" the way you do. Everyone (in real life at least) has cellulite, scars, bumps, bruises, hairs, blemishes, stretch-marks, and more. Be nice to yourself and be nice to those around you. Enjoy your summer, make the most of it, take a risk with a swimwear style you might not otherwise choose, and do whatever is necessary to feel your best. My name is Amelia Blaire, and I am an outfit repeater. I also love teaching myself how to sew, refashioning, bargain hunting, making lists, promoting #adoptdontshop, watching Jeopardy, black beans, dark chocolate, all things creepy, Taco Bell, Carmex, and art. So You Say You Support Women? Is There Such Thing as Modest Swimwear?